Hoosick, NY. Courtesy of the Boston Public Library, Leslie Jones Collection. Although I hadn’t anticipated it, Mr. 80K Chief was just the beginning of several days in the Winterthur library and archives researching mass-produced statuary and emblems that began to furnish the commercial districts of American towns, both large and small, during the last decades of the nineteenth century. Although various emblems including eagles, giant tools or notions, and Indian Chiefs have been around since the 1600s to signal to consumers that a shop was ready for customers, the mass production of these items escalated after the Civil War. As with most of the material on this blog, there is too much to say on the topic of emblems on Main Street (you’ll have to buy the book), but there’s one story I compiled that’s just snappy enough to lay down here. At the Museum of Arts and Sciences in Daytona Beach, Florida is a carved wood statue of an Native American figure, on loan to them from the Smithsonian. It’s likely on loan to this Florida museum because at some point in the last 25 years, the Smithsonian decided that it was a Seminole. The date of the piece isn’t certain, but it is believed to be from around 1885-90 and it’s attributed to Samuel A. Robb. I’m convinced this date is wrong, however, because of the fascinating story to follow. Robb was what was called a “house carver” at Wm. 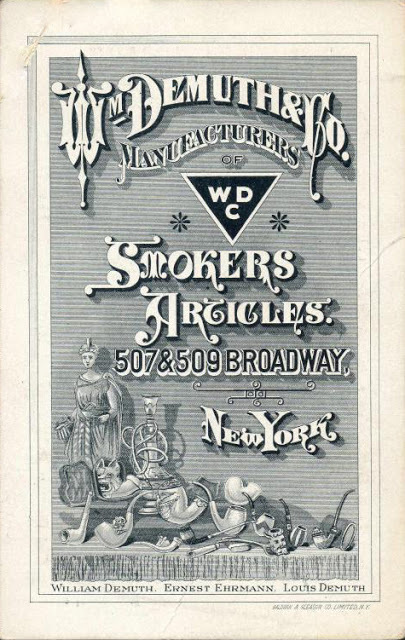 Demuth & Co., a firm that specialized in cigar store trade figures and other emblems during the 1870s-1890s. Although Demuth mostly produced fancy pipes and show figures like the cigar store Indians, other businesses sold all kinds of emblems: various types of Indians, ladies of liberty, eagles on balls, lions with mortars (I’m still not sure what that’s about…), locks, and other things. They livened up Main Street with decoration and fantasy and a bit of civic art. Finding that wood statuary was on the costlier side to produce (hand carving was no quick task), not to mention highly susceptible to splitting and weathering from rain, Demuth sought another media for his wares: cast zinc. 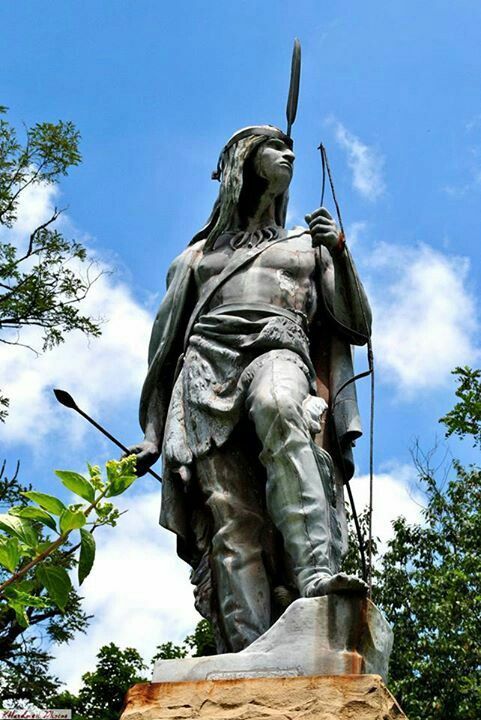 Around 1869 Demuth began working with a New York foundry that specialized in zinc work by the name of M.J. Seelig & Co. to have molds done of Robb’s Native American figure. These molds then were used to cast bunches of zinc figures. 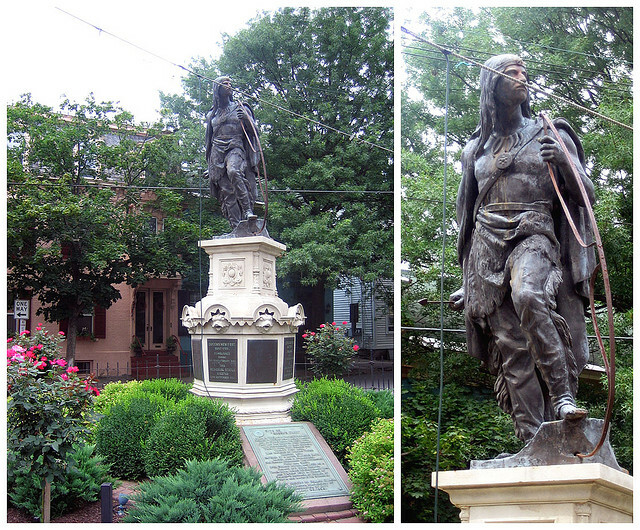 The 1872 Demuth catalog identifies the statue as “Indian Chief No. 53.” Demuth exhibited these at both the Philadelphia Centennial Expo and the 1893 Chicago World’s Fair. They were a hit! Here is one that still has some of his paint, auctioned off in 2002 for $17,500. Another Demuth No. 53 was sold off at Murphy’s Auction house in 2011 as part of a large lot of objects that had belonged to a cigar museum in Tampa, Florida. No. 53 wasn’t only available through Demuth, however. 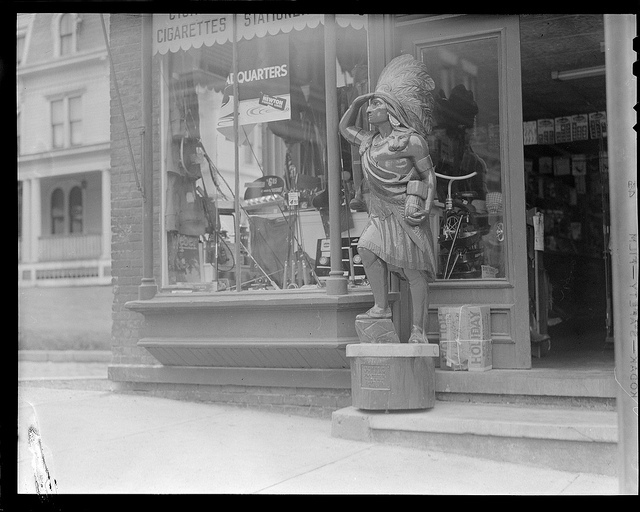 Demuth’s casts largely went to cigar store owners before the mid-1890s, but just before and after 1900, when having a big Native American statue in front of your smoke shop had become unfashionable, No. 53 became a public monument. Many were sold to towns across the nation through J.W. Fiske and J.L. 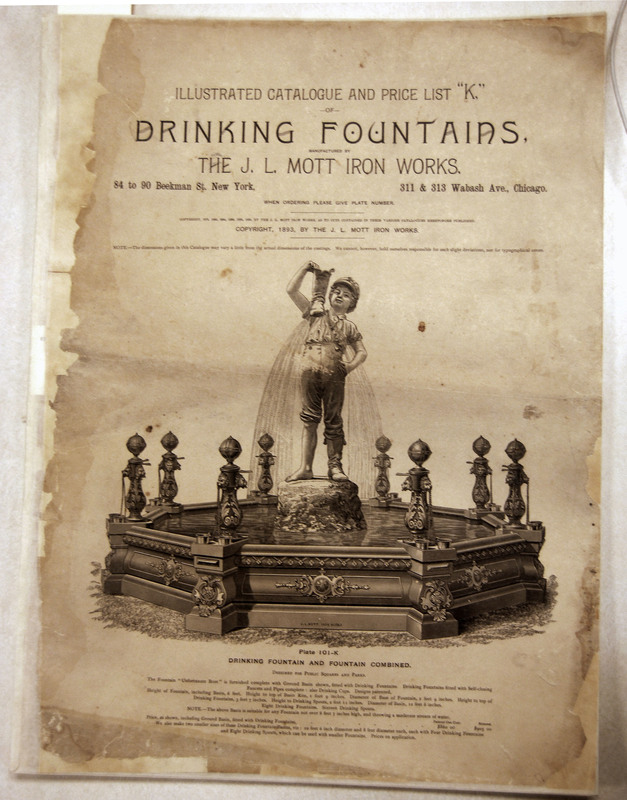 Mott, other New York companies that specialized in fountains and other iron work and zinc statuary. A little internet digging and book research reveals a host of Indian Chief No.53s dotted around the country, at cross-roads and in public parks, many of which are (or were, some are no longer around) located in small towns: Kankakee, IL; Muscatine, IA; Ishpeming, MI; Brandywine, DE; Barberton, OH; Sharpsburg, PA; Point Richmond, CA; Fargo ND; Akron OH; Tilton, NH; Calhoung, GA; Mount Kisco, NY; Lodi, Ohio; Mingo, WV; Forest Glen, MD; and Schenectady, NY. In all, there are 25 known to have existed or still existing. Mohawk, an Iroquois, a Mascoutin, and a member of other tribes—typically informed by where a copy ended up. The one in Tilton, New Hampshire is named Squantum, named after a Pawtuxet man who served as interpreter, guide, and instructor to the Plymouth Pilgrims. No. 53s also occasionally identify J.W. Fiske or J.L. Mott as the “artist” because the only names on the statues are often the vendor’s marks. These townspeople would, I’m guessing, be a little sad to know that Lawrence was ordered out of a catalog and not hand-crafted in some sculptor’s workshop. But I would caution against such disappointment at the mass-produced origins of their civic sculpture. There’s a wonderful and heroic story in small town America’s reach, through the nation’s rail system, from their little public parks to the great island of Manhattan, sourcing statues and fountains to adorn their public spaces. To learn more about zinc sculpture in America, see Carol Grissom’s excellent book on the subject. To learn about cigar store and show figures statuary, see Artists in Wood by Frederick Fried.